Jesus Christ, can you believe July is all ready over? 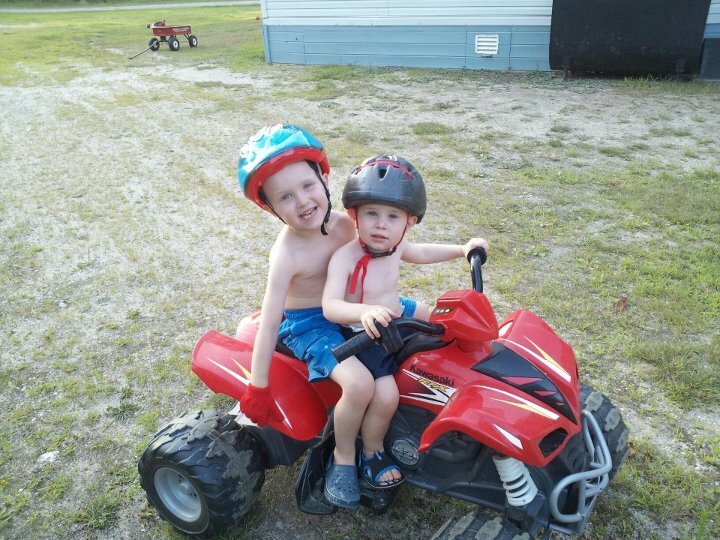 Why do Maine summer's go by so fast (oh, god, I'm sounding so..."Mainer.") A lot of little stuff has been happening, so let's just take a moment and catch up. Grab a cup of coffee, well wait, it's 10 o'clock at night, how about a Gin and Tonic, pull up your computer and let's get started. In a previous post My MIL is an Alcoholic and It's Annoying As Hell I told all about my obnoxious alcoholic mother-in-law. For an update on that, she is currently sober. After a near death experience she ended up in rehab and she and my father-in-law are no longer drinking. After weeks of isolation, Josh and his brother, finally went over to their house and had "the talk." Josh got everything off his chest he needed to. The fact that they aren't apart of our kids life, the secrets about her drinking, etc. I am really proud of him for getting it all out there and they totally took responsibility for their actions. I'm still a little skeptical about what the future holds but as in any 12 step program, "one day at a time." Moving on to my current, "Get Fit, Get Fabulous," attitude, I'm still working it. I have been running (up to 2 3/4 miles #bragmoment.....Josh just read this part and says I'm gay..haha) and am biking when I can. I am still a Beach Body Coach and have ordered Shakeology and TurboFire. I can't wait to receive it in the mail and get started. If I dare I will post before and after pictures. The before pictures might kill me though. Another post regarding baby fever, is no longer relevant. All baby fever no longer exists. Every day Drew is learning new words and is changing so much and I'm loving it. My biggest problem now is that I need to stop calling him my baby as he is going to be 2 in November! On the other hand, we are going to a BBQ on Sunday and will be seeing our friends, Kara and Michael's newborn, so this could all be a mute part in the post. In other news, we have been doing the whole fair thing and going to parades. Jacoby caught his first fish on Daddy and Son day. Jacoby had so much fun. They went fishing, bought a new toy and movie, went out to lunch at McDonalds and went out for an ice cream and went hiking. By the time I got home, he looked completely exhausted. The Daddy and Son day has been a yearly event that Jacoby gets so excited for that it melts my heart. He is such a good boy and the way he loves Josh is really, really special. 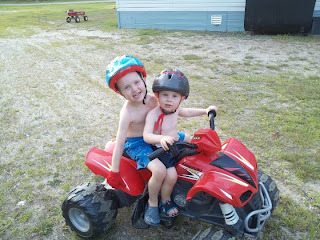 We recently put Drew on Jacoby's 4 wheeler and he loves it, constantly asks to go on it, which find to be super cute! He doesn't go very far on the 4 wheeler, but he loves just sitting on it! 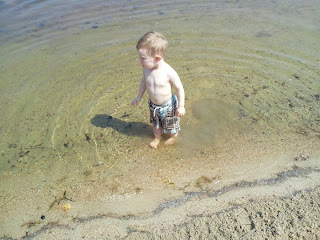 We have been going to the beach and Jacoby is doing sooo much better in the water than last year. He actually went fully under the water which is super impressive. The kid has no problem squishing the ugliest bug with his bare hands, but getting his eyes wet is like the most terrifying event ever. and of course Drew, my little brute, has no fear at all! He fell under the water numerous time and I had to rescue him by pulling him up by his arm and he would laugh hysterically with his little dimples shining brightly. Beyond just life and work and family time, that is pretty much it in a nutshell. Living in Michigan, I ALWAYS felt the same way. "Where the heck did the summer go?" You get so cheated when you live in the Midwest and Northeast regions! Hi! Thanks so much for the nomination...what a nice surprise this morning to find out about it, especially on my vacation! Thank you! thanks for coming over today and your sweet comment!! love your blog, you have a beautiful family!! I'm your hundreth follower...woot, woot....what do I win, what do I win...LOL, just kidding! Thanks for the follow and comment. How did I miss this?? We will blame it on vacation head. Anyways..thank you so much for the nomination. I have received this award before though...is it possible to get it twice?? Summer has flown by hasn't it? We have just been trying to enjoy it the best we can, despite the crazy heat. 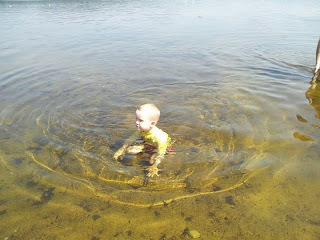 We were swimming a lot but this past few weeks it's just been too hot to even go swimming. Figures!